Press releases written for businesses, organizations and educational institutions. 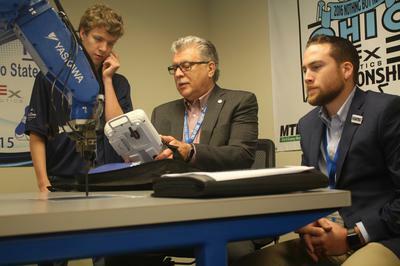 The inaugural RAMTEC Robotics Summit celebrated the success of the Tri-Rivers Career Center Robotics and Advanced Manufacturing Technology Education Collaborative now duplicated across the state. Attendees discussed how to address a looming skills gap and its potential economic repercussions. Membership in ATX Factory, an amenities-filled east side co-working space, now gives members access to co-working spaces in other major cities around the world. ATX Factory is pleased to announce that it has joined the League of Extraordinary Coworking Spaces, a network of more than 70 high-end co-working spaces across the United States and the world including countries like Canada, China, New Zealand, Australia, the United Kingdom and Singapore. QCrew BBQ Catering Co., known for serving quality barbecue at graduations, casual weddings and other celebrations since 1995, is pleased to announce the launch of its new pickup service. QCrew Back Door BBQ Catering offers customers the convenience of ordering food without booking a fully catered barbecue event. They can order ahead and either pick up the food or have it delivered the day of the event. DALLAS, TX – FEBRUARY 1, 2017 – Companies reliant on skilled workers from overseas anxiously await word on possible changes likely under President Donald Trump. Dallas immigration law firm Davis & Associates stands ready to help employers navigate through what often can be a tricky process. Moving into a big city can seem daunting. Newcomers to Dallas now have an online destination dedicated to helping them get to know their new home. The Dallas New in Town website is all about Dallas. It features information on events, city guides to point people in the right direction and news and updates relevant to Dallas residents.